This article is about an ethnic group originating in the Caucasus. For ancient people from the Iberian Peninsula, see Iberians. Caucasian Iberians is a Greco-Roman designation for the population of Caucasian Iberia, a Kartvelian (Georgian) speaking people in the east and southeast Transcaucasus region in Antiquity and Middle Ages. In the southwest, Iberians extended into Anatolia, inhabiting interior lands beside Colchians, who lived along the littoral area. Ancient Caucasian Iberians are considered to be the ancestors of modern eastern Georgians as well the Laz people, another Kartvelian-speaking group. The area was inhabited in earliest times by several related tribes (Tibareni, Mushki, Saspers, Gugars, Diaokhi, etc.) collectively called Iberians (the Eastern Iberians) by ancient Greek (Herodotus, Strabo, etc.) and Roman authors. Iberians called their country Kartli after a mythic chief, Kartlos. One of the Iberian tribes of Mtskheta (the future capital of the Iberian kingdom) dominated the early Kingdom. 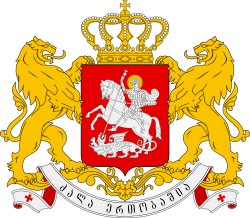 The Mtskheta tribe was later ruled by a prince locally known as mamasakhlisi (Georgian for “the father of the household”). The Roman general Pompey invaded Iberia in 65 BC, during his war with Mithridates VI of Pontus, and Armenia; but Rome did not establish her power permanently over Iberia. Nineteen years later, the Romans again marched (36 BC) on Iberia, forcing King Pharnavaz II to join their campaign against Albania as their ally. 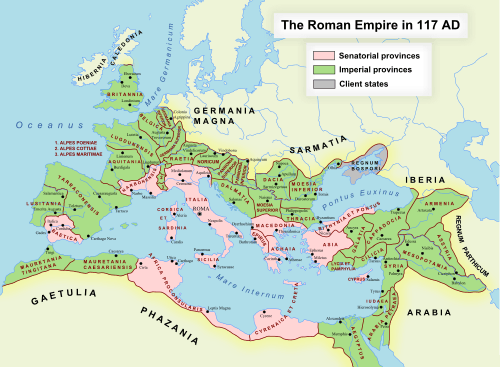 While another kingdom of Colchis was administered as a Roman province, Iberia freely accepted the Roman Imperial protection and became her ally. The Iberian king Mirian III adopted Christianity as a state religion in AD 327 (this event is attributed to the mission of a Cappadocian woman, Saint Nino, who since 303 had preached Christianity in Iberia), and Iberia allied itself with the Roman Emperor Constantine the Great. The religion would become a strong tie between Iberia and Rome (later the Byzantine Empire), and would have a large scale impact on the state's culture and society. However, after Emperor Julian was slain during his failed campaign in Persia in 363, Rome ceded control of Iberia to Persia, and King Varaz-Bakur I (363-365) became a Persian vassal — an outcome confirmed by the Peace of Acilisene in 387. The early reign of the Iberian king Vakhtang I dubbed Gorgasali (447-502) was marked by relative revival of the kingdom. Formally a vassal of the Persians, he secured the northern borders by subjugating the Caucasian mountaineers, and brought the adjacent western and southern Iberian lands under his control. He established an autocephalic patriarchate at Mtskheta, and made Tbilisi his capital. In 482, he led a general uprising against Persia. A desperate war for independence lasted for twenty years, but he could not get Byzantine support, and was defeated, dying in battle in 502. The medieval Georgian chronicle Kartlis Tskhovreba (“History of Kartli”) claims that a Persian general Azo of Alexander’s army massacred a local ruling family and conquered the area, until being defeated at the end of the 4th century BC by Prince Pharnavaz, who was at that time a local chief. Pharnavaz, victorious in the power struggle, became the first king of Iberia (c. 302-c. 237 BC). 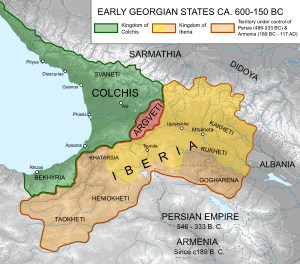 Driving back an invasion, he subjugated the neighbouring areas, including a significant part of the western state of Colchis (locally known as Egrisi). Pharnavaz then focused on social projects, including the citadel of the capitol, the Armaztsikhe, and the idol of the god Armazi (derived from the Iranian god Ahura-Mazda). He also reformed the Georgian written language and created a new system of administration, subdividing the country in several counties called saeristavos. His successors managed to gain control over the mountainous passes of the Caucasus, with the Daryal (also known as the Iberian Gates) being the most important of them. It may be possible to trace the presence of Caucasian Iberians in the region for several millennia. The Iberian tribes were an indigenous people of the Caucasus region, united by a common language, the ancestor of the Ibero-Caucasian language group. There are multiple theories regarding the origin of the name Iberian; one of the most commonplace is that it is derived from the tribe of Tibareni in the classical period, and possibly also from the even earlier state of Tabal, known from the annals of the Assyrian Kings. The name Iberian in its own right appears in ancient Greek authors who identified early Georgian (Kartvelian) tribes as Iberoi, as well as in the annals of the Greek Plutarch. The Iberians called their kingdom Kartli, and their nation Kartlians. Some theories have proposed common ethnic and linguistic origins of ancient Caucasian Iberians with the Iberians of the Iberian Peninsula, or the modern Basques in Spain.